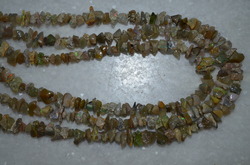 Our enterprise is engaged in offering an appealing collection of Semi Precious Chip Bead for our clients. Designed with the optimal quality basic material, it is in compliance with the set industry norms. Further, we offer these chips to our esteemed clients in different sizes, alluring patterns, attractive designs and shapes. Lemonquartz Uncut Chips Beads, Lemonquartz Chips Bead, 36 Inches Strand Products Price: 2.5 $ per line 'Based on the dollar and may vary as per dollar fluctuation. We are offering Chrome Diopside Chips to our clients. Products Price: 14 $ per line 'Based on the dollar and may vary as per dollar fluctuation. 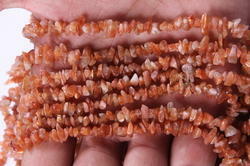 We are offering Rhodonite Uncut Chips Beads, Rhodonite Chips Beads, 36 Inches Long Strand to our clients. We are the wholesaler of all kinds of gemstones. Kindly contact us for price deal. We offer high quality chip beads.